As I was walking into the American Yuppie priced, feeling a little Hippie Crossroads coffee shop here in Panajachel, I asked my friend Anthony. "What is a combination of yuppies and hippies?" 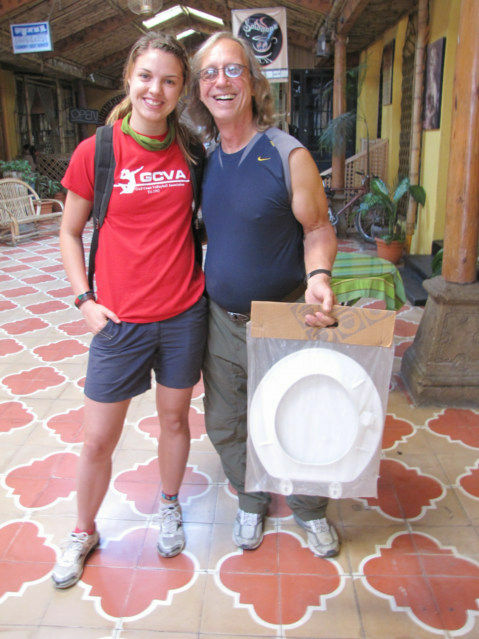 Chris is carrying a toilet seat he purchased back to the Hotel El Amigo here in Panajachel; somehow, he has broken two toilet seats and feels it is his responsibility to purchase a new one. He stopped into the Dinosaur Coffee Shop, and receives his daily kiss from this missionary girl. "She gives some love, and maybe I will come to church services." I truly believe the Christian religion is the easiest religion to follow on planet earth. Step Three: Through the grace of God, I am granted mercy, I am forgiven, even though I am guilty, I will never be punished for my sins. Finished, and hopefully we go forth and sin no more. Missionaries often make me feel, I need to pay to be forgiven, that is not the deal offered. I have to go do a bunch of good deeds, listen to music, and kiss everyone, and hang out in a bar called Solomons Porch. "Andy you need to pray." "I do not sin, that saves on the need to pray so much." "If I do not sin, I do not need to ask for forgiveness as much." "Why do they need to pray so much?" I kind of think many missionary believe with good music, good love, and good kisses, then add in a few good deeds, this will believe they will pay the entrance fee to heaven. Then, they get the church to pay for their missionary trips to Guatemala, a country that is up to its ears full of Christians, write it off on their taxes and by good deeds, they are saved. "That is the worst thing to tell me, the last thing I want to do is listen to music at a church service." "I cannot hear the voice of God when everyone is playing music, kissing me, and trying to make me do good deeds." Haha, Andy, spoken like a true saint. Any one can live a morally questionable life and constantly apologise to an invisible being for it to make themselves feel better. It is quite another thing to try and live a good life, to try and not need to apologise so much, to try and live good morals. It is very fashionable for us to send our 18 year olds half way around the world to get them to build orphanages and schools. It's a cheap way for parents to teach their children life skills without having to teach them anything. Noone likes to be reminded that they are depriving local builders of income and perpetuating the problems they are there to fix. Noone likes to be reminded that they have the same impact on the buying-power of locals as the rest of the noisy tourists have. If you want to save Africa or Latin America, you need to employ the Africans and Latin Americans, and maybe have a couple of people around to make sure the money is being correctly channelled. I should add that the article references Margaret Singer, but she's a rather hateful woman who deliberately stirred up anti-cult hype to further her career. I was wondering why it got quiet around here all the sudden. Hey Andy, I find a quiet place every day to think and pray, no music, no anything, just me talking to God. I thank Him for all the things in my life I appreciate and enjoy, something different every day. Sometimes it is the spring flowers or sometimes watching a another person being kind to a nice old senile neighbor I have enjoyed over the years. Nothing special but everything special to me. It makes me forget the happenings in life I am not so fond of. It also makes me realize that there are some things in life that cannot be changed and accept them and work hard to change the things I can. I absolutely ask Him to give healing to many people I call by name and of course, like a child, I ask for lots of things for my family and others but always remember God is in control. I know His Love and grace covers the many times I goof up and sin. That is the reason it makes me happy to pray because I Love God.